Alpha, higher-than-expected returns generated by an investment strategy, is the holy grail of the investment world. Achieve alpha, and you've beaten the market on a risk-adjusted basis. 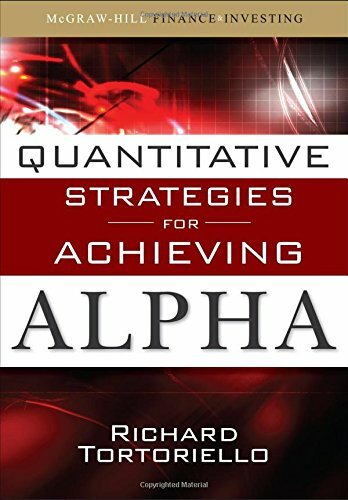 Quantitative Strategies for Achieving Alpha was borne from equity analyst Richard Tortoriello's efforts to create a series of quantitative stock selection models for his company, Standard & Poor's, and produce a “road map” of the market from a quantitative point of view. This powerful, data intensive book will help you clearly see what empirically drives the market, while providing the tools to make more profitable investment decisions based on that knowledge--through both bull and bear markets. If you have any questions about this product by Tortoriello Richard, contact us by completing and submitting the form below. If you are looking for a specif part number, please include it with your message.